Lake Worth is named after the nearby Lake Worth Lagoon. The city was first settled by an African American couple, Samuel and Fannie James in 1885. They made a claim to the land through the Homestead Act and received the receipt in 1887. When Henry Flagler extended the rail line from West Palm Beach to Miami, developers Bryant & Greenwood began to develop Lake Worth. More people began to occupy the homes and Lake Worth was incorporated into a city in 1912. Currently, Lake Worth features historic buildings, beautiful beaches, a fishing pier, restaurants and art galleries. Lake Worth is home to over 35,000 residents according to the 2010 US Census. Amongst these residents are the reliable moving company Lux Moving and Storage. All of our movers are long time residents of Palm Beach and are well-known in the community. Our mission is to provide the highest quality moving services throughout Lake Worth. For a moving company that values your items, time, and customer satisfaction, Lux Moving Storage is Palm Beach’s #1 choice! Downtown Lake Worth is a vibrant, artsy, laid-back hangout spot. It features art galleries, restaurants, music venues, and specialty shops. 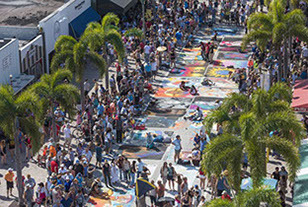 Lake Worth’s Downtown also hosts the yearly Street Painting Festival, where artists fill the streets with huge chalk street drawings. Many of them depict realism or 3D perspective. Whether it be commercial shops, art galleries, restaurants or residential areas, Lux Moving & Storage are the experts in Lake Worth. 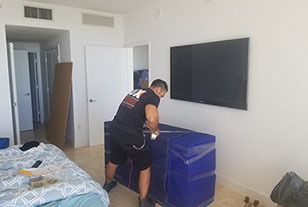 We take pride in knowing that Palm Beach County is our home and we are fortunate to serve both residential and commercial moving services to everyone! Servicing the Lake Worth area for over 9 years now, Lux Moving and Storage has come to know all of the 7 square miles of Lake Worth. We have left lasting impressions on the toughest client critics. All over the city we continue to go above and beyond customer expectations, making a standard practice out of our client’s satisfaction. Be one of many to have a truly great moving experience and reach out to us for your moving needs. Give us a call and see why Lux Moving and Storage is so highly recommended in the moving industry!